The latest financial statements of all 16 town councils were unqualified with the exception of Aljunied-Hougang Town Council (AHTC). Its statements were qualified by external auditors because of an internal control weakness, where the Workers' Party-run town council did not record expenses incurred in a timely manner, the Ministry of National Development (MND) said yesterday. "This is the seventh consecutive year that AHTC has received qualified statements from its external auditor," the ministry, which oversees public housing in Singapore, said in a statement. An unqualified financial report means the auditors had concluded the financial statements present an organisation's affairs fairly in all material aspects. When qualified, it suggests the statements broadly reflect the case, except for a specified issue or two. The annual Town Council Management Report for the financial year ending March 31 this year shows AHTC got the top score of green for its performance in management of arrears in service and conservancy charges (S&CC) - for the first time since 2012 when the rating system was rolled out. 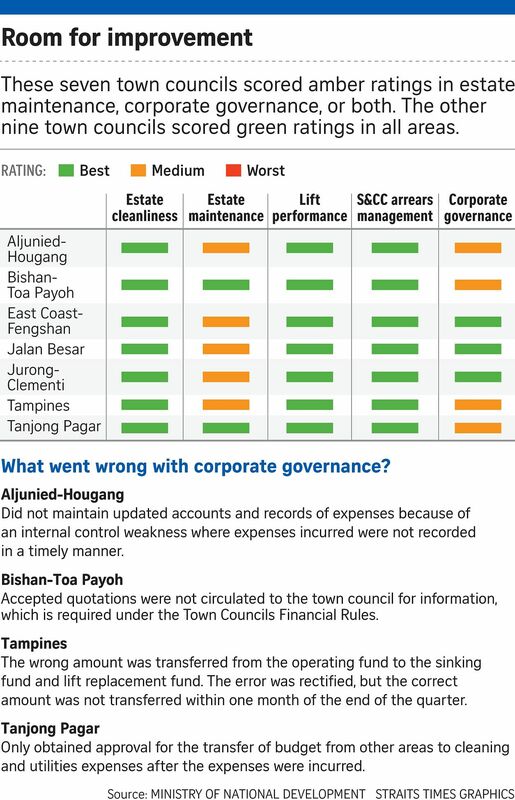 It also got for the first time the next-best amber score for corporate governance, a ranking that puts it on a par with three other town councils: Bishan-Toa Payoh, Tampines and Tanjong Pagar. In past years, AHTC received mostly the lowest red rating in both areas, but in the last financial year ending March 31, 2017, it received an amber score for S&CC arrears management. The AHTC, responding last night to the ministry's point that its financial statements were qualified for seven years, said this gives the impression it "has stood still for seven years". "We believe MND's specific reference to seven consecutive years is deliberately calculated to lower the esteem of AHTC in the public eye," it said in a statement. The ministry has presented the audited financial statements to Parliament. Town councils, which run HDB estates, will post their financial statements on their websites. The Town Council Management Report looks at five areas of performance: estate cleanliness, estate maintenance, lift performance, S&CC, and corporate governance. And they are given green, amber or red scores. The ministry said AHTC's amber rating for corporate governance was because it did not maintain updated accounts and records of expenses. This was also the reason it had qualified financial statements. But AHTC said in its statement that the ministry's assessment was "selective and incomplete", noting that its observation omitted points made by the external auditor. These included the fact that "there are no material misstatements found in the expenses and related payable transactions during the financial year", AHTC said. In contrast, MND described the errors made by Tampines Town Council in an "even-handed and balanced tone", AHTC added. Tampines had transferred the wrong sum from its operating fund to the sinking fund and lift replacement fund. The ministry said Tampines had "identified the computational error and rectified it", but added that the issues were still considered a case of non-compliance as the correct amount was not transferred in one month after the end of the quarter. In Bishan-Toa Payoh, accepted quotations were not circulated to the town council for information, which is required under the Town Councils Financial Rules. In Tanjong Pagar, the approval to transfer the budget from other areas to cleaning and utilities expenses was obtained only after the expenditure had been incurred. Mr Ang Wei Neng, chairman of Jurong-Clementi, said the main factors for his town council's amber rating for estate maintenance were that residents placed objects or erected blinds along the common corridor. He added that enforcement action would be taken if items block the corridor such that a wheelchair cannot pass. MND said that for the next financial year, areas measured under estate cleanliness and estate maintenance have been updated to sharpen the focus on issues of public health, safety and the living environment.